When you think about HVAC companies, many don’t think past the home comfort services these businesses provide. Inside the HVAC industry, we know there are so many contractors going above and beyond to help their communities and provide so much more than simply heating, cooling, and indoor air quality help. HVAC.com aims to highlight some of these efforts and give our blog readers a look at the world of good our industry is involved in. In our first Featured Contractor post, we wish to share with you the community involvement and charitable efforts of Radiant Plumbing & Air Conditioning in Austin, Texas! Radiant Plumbing & Air Conditioning spurs community interaction and contributes to the “Keep Austin Weird” culture of their community through their annual toilet window display contest. This is a decades-old tradition for the company, invoking creativity among participants. What is the toilet window display contest? Participants are encouraged to transform a regular porcelain toilet into a personified character, incorporating a witty, play on words slogan linking plumbing with current trends. In 2019, Radiant has opened their contest to local residents, extending the fun further into the community the company serves. The toilet window display remains year-round, and winners receive a $100 prize and a photo in front of their display. The toilet window display contest has attracted a great deal of participation and attention for Radiant, as they won the title of Austin Chronicle’s Best Window Display in 2014. Owner/Operator Brad Casebier says Radiant’s contest is a way to keep the community’s vibe alive and work together. To enter Radiant’s toilet window display contest, interested Austin residents may make submissions online. While the toilet window display contest is certainly what caught our eye at HVAC.com, we quickly found this isn’t the only great thing this HVAC industry member does for others in their community. Radiant’s Community Service program supports local Austin 501(c)3 non-profit organizations. 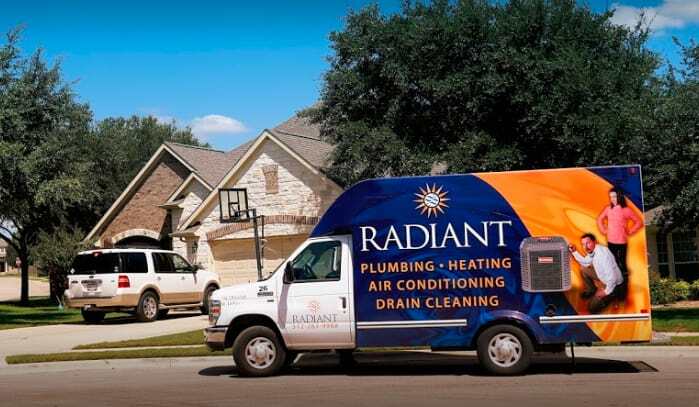 The company’s community service program was initiated by the owners who have committed to giving back to their Austin community for their loyalty and support of Radiant throughout the years. Austin Pets Alive!, an organization dedicated to protecting Austin’s animals. Radiant has given $35,000 to APA! over the years and also provides the organization with regular free or discounted services. In 2017, co-owner Sarah Casebier with the help of the company’s customer management software provider Service Titan, created an organized volunteer dispatching system that aided in Hurricane Irma search and rescue in South Texas. Wonders & Worries, a local organization dedicated to the health and well-being of the communities children and families. The Joyful House Project, assisting returning combat veterans and their families in building bonds and creating connections with the help of abused and neglected horses. Catalyst Teen Center, focused on inspiring Austin’s young leaders in making a real impact with their futures. Please visit the HVAC.com Blog and continue to follow our stories highlighting the great efforts of our industry. If you need heating, cooling, or indoor air quality help in your home, we encourage you to search our HVAC Contractor Directory to find a trusted, local HVAC company who will help.